The focus of a farmers’ market is, of course, going to be the local farmers. At the Janesville Farmers Market, we make local farms a priority, but we also know that it is more than the awesome fresh produce and the joy of interacting with growers that draws people downtown every week, rain or shine. 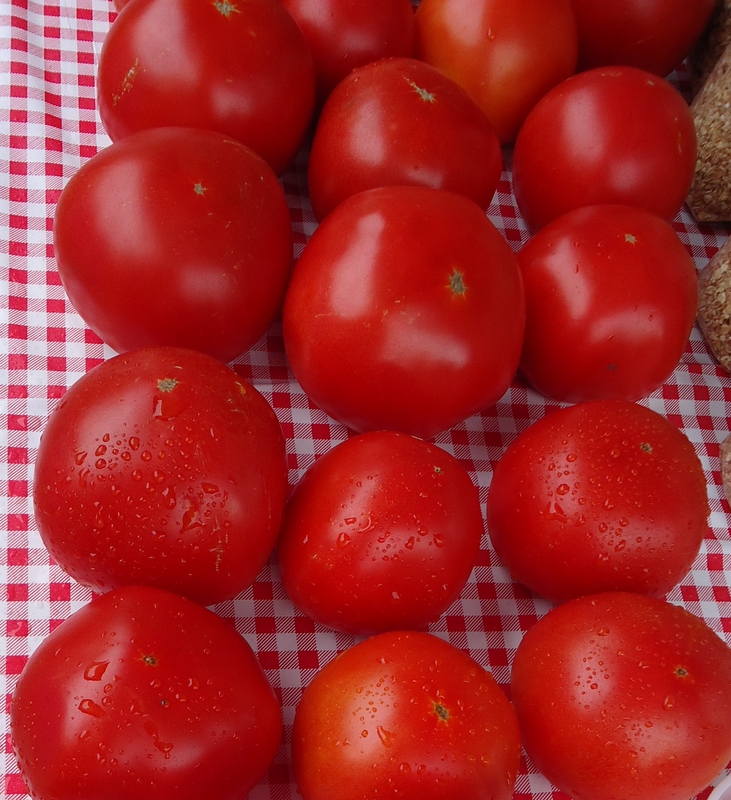 Here is a short list of items you may be surprised to find at the farmers’ market. Upcycling occurs when crafters give new life to items destined for the landfill or recycle center. 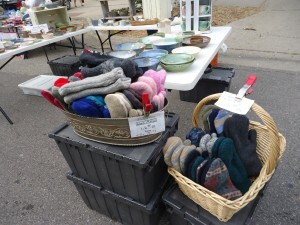 Whether it is mittens lovingly stitched from worn-out sweaters or candle holders made from liquor bottles, upcycling diverts waste from landfills, saves energy and provides artists with unique materials at a reasonable cost. Do you think it’s too early for tomatoes? Not if those tomatoes were grown in a heated greenhouse. More and more Midwestern farmers are using season extension techniques to make the most of the growing season. We have always had some greenhouse grown plants and flowers at the Janesville Farmers Market. As time goes on, I predict that we will see more and more food grown in heated greenhouses, unheated “high-tunnel” hoop houses and even floating row covers. These methods not only provide localized climate control, but may also offer protection from certain diseases and insects. Though farmers will never be immune to weather fluctuations, season extension methods can be an important tool. We want to be able to grab a snack while we shop, but ideally that snack is from a local restaurant or food vendor. 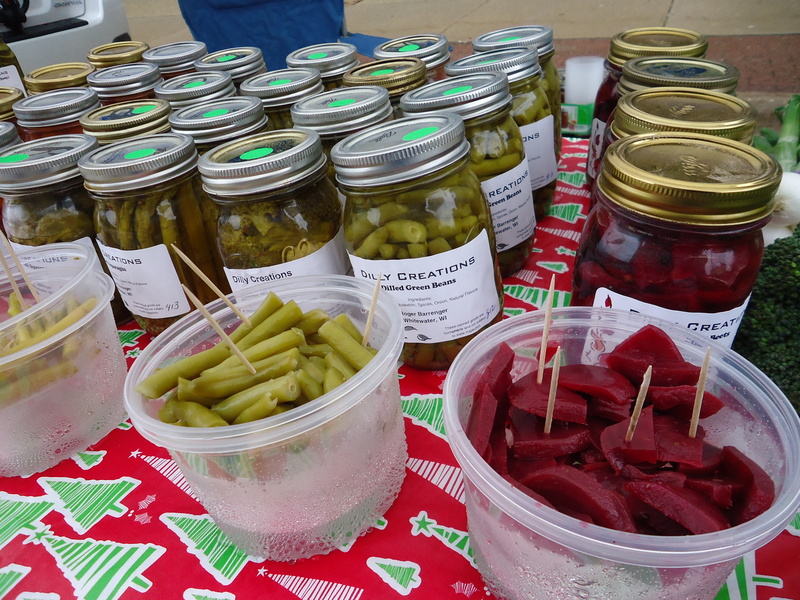 The Janesville Farmers Market favors prepared food vendors who have local, small businesses. You won’t find typical fast food options here. Instead, look for sandwiches and wraps featuring produce and cheese from the market itself. One local restaurant on Main Street even offers a farmers market omelette made with local ingredients. In Wisconsin, there are two ways to produce pickles and preserves to sell at a farmers’ market. The first way is through a licensed commercial kitchen. The second way is in a home kitchen with careful attention to sanitation and safety. The latter is made possible through something called a pickle law. The pickle law provides strict guidelines for acidity, safety and labeling of home-canned pickles, preserves and relishes. This law allows farmers to safely can their surplus produce for sale at the market. Roger Berrenger of Dilly Creations said that he started doing pickles because he just got tired of having produce left over from the market. With pickles, he is no longer limited by the short shelf life of his garden produce. Baked goods are a popular addition to many farmers’ markets. The Janesville Farmers Market boasts no less than six local bakeries this year, each of them with something different to offer. In addition to delicious breads, scones and pastries, you will find more and more specialty items for unique dietary needs. We can directly attribute the expansion in special offerings to the customer – producer interactions that are inherent in a farmers’ market setting. If you look closely on any given week, you may find vegan treats (no dairy or eggs), items made without gluten (an allergenic protein in wheat) and items that are low in added sugars. Our non-human friends like their treats too! You will often find high quality pet treats at the Janesville Farmers Market. These treats are made with human-quality ingredients. Makers of pet treats must follow state regulations with regard to ingredients and labeling. Of course, they have also passed several canine and feline taste tests. Most weeks you will also find collars and other pet accessories at the market. Local non-profits and sponsoring businesses add interest and fun to the market. In the past, we have had games, activities, raffles, races, food samples, kids’ activities and local actors. Businesses who sponsor the market at the squash level or above get to have a booth presence at the market. 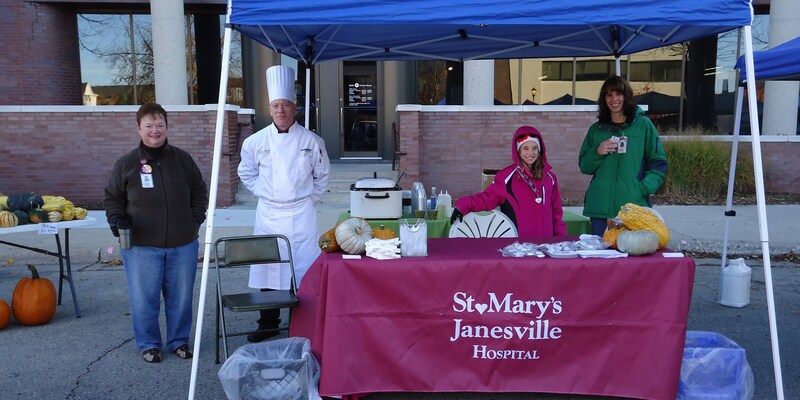 St. Mary’s Janesville Hospital is one example. They like to come to the market and provide healthy recipes, food samples, veggie peelers and more. 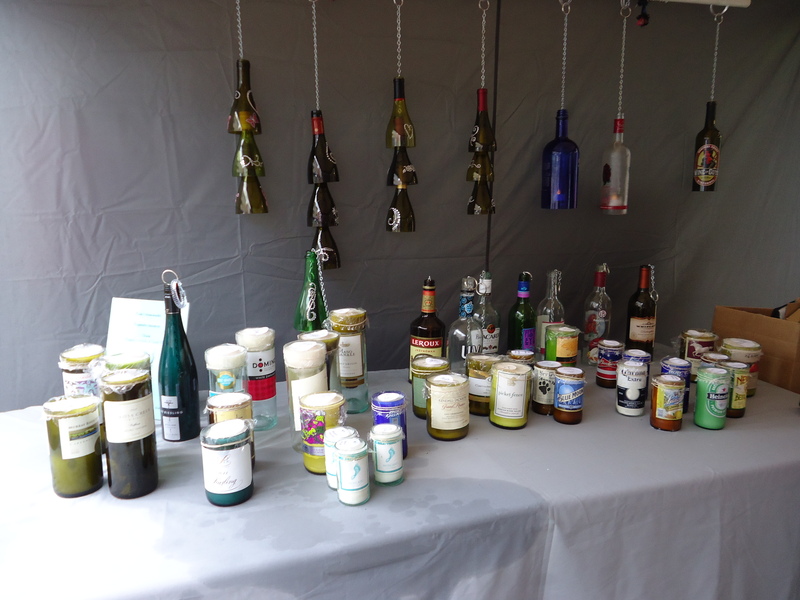 What unexpected pleasures and treasures have you found at the Janesville Farmers Market?